Thank you for visiting our vacation rental site. We are please to share with you a very special property that has so much to offer! This rental is a fully loaded guest house attached to the main house on the property. The guest house is completely separated from the main house with its own entry and sliding glass door leading to the back yard/patio. So the experience is very quite and private. The rental has all the feature of a home with full furnished kitchen, laundry(washer and dryer), large living area, beautiful bedroom with his and hers closet, and one of the most unique bathroom you might find. The ceiling in the house is vaulted to 12 feet high and 5 skylights with very open feeling. Everything about this guesthouse had been very carefully designed and detailed. You are going to enjoy lots of color, natural stone, artwork, and warm inviting spaces that just relax your soul. Did we mention the really cool sunken Jacuzzi bathtub, surrounded by natural stone, and beautiful plastered wall. It’s beautiful and relaxingl! The patio and backyard are just extensions of the guest house living space, very large, very quiet. It’s fully furnished lounge area with wicker sofas and tables, along with granite BBQ Island with outdoor refrigerator. Also dinning table for 4, so this really is large extended living space. The rest of the yard consists of 30 roses bushes and mini grape vineyard. Gazebo in the corer with swing bench which small table and chairs which looks out over the lawn for perfect morning coffee. Also the location of this house is excellent for the travelers with many different purpose. We are right in between of Disneyland and beautiful beaches, about 7 miles away to each location.We welcome couples, singles, families with small children, get away trips and business trips. If you always stayed in hotels and never stayed in vacation home, we definitely recommend you to try this guest house! We will be happy to help you with any questions you might have! Note: My husband Jon and I, along with 2 mall children live in main house. We are very friendly but respect your privacy. We will be more than happy to help you with any questions during your stay. * Kitchen – stove, oven, dishwasher, microwave, large refrigerator, coffee maker, rice maker, utensils and pot and pans. * Living room – HDTV, dining table, sectional sleeper sofa, another sleeper couch which provides sleeping for 4 more people besides king bed. sheets are provided. *Bed room- King bed, his and her closet. *Bath room- jet sunken tub, shower. 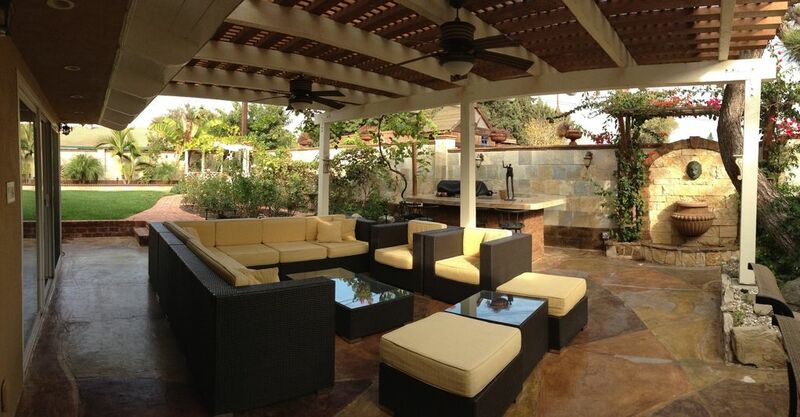 * Patio- lounge area with wicker sofas and table, dining table, granite counter BBQ island. * Backyard- large lawn area, rose bushes, and gazebo with swing. * A/C system is sensor regulated. Please feel free to call/text owner anytime during your stay to adjust. Hi, my name is Jon. I have lived in Orange County all my life. Since I’m a general contractor, over these last 20 years, I’ve made dramatic upgrades to the house. For the last 10+ years, my wife Miki and I have offered this home as a vacation rental property. We were the one of the first in Orange County to do this. We realize now there are many options for vacation rental home. However, we are very confident we remain in the top tier of vacation rental properties for price, value, and quality since we put our heart, soul and life experience into it. We are very friendly and hospitable, and would love to do all we can to help you with your vacation accommodation in Orange county California! For family with baby: Portable crib can be provided. Please let us know if you need them.